We know consumers are increasingly interested not only in where their food comes from but how it is grown and by whom. We share consumers’ desire for transparency about what goes into our products. To create supply chain resiliency and enable growth, we need to protect and conserve the raw material base our business depends on. And we believe passionately that we can use General Mills’ size and scale for doing good. ‘Treating the World with Care’ is one of our key corporate pursuits and something that’s long been in our company DNA. For these reasons, we made a commitment in 2014 to sustainably source our top ten priority ingredients by the end of 2020. These commonly used ingredients, which represent more than 40 percent of our annual raw material purchases, include cocoa, vanilla, oats, wheat, sugar beets, corn, milk, sugarcane, palm oil and fiber packaging. By the end of fiscal 2018, 85 percent of the raw materials outlined in this commitment were sustainably sourced. Hurdles remain, but we continue making progress toward our 2020 goal. To get there, we focus on improving the environmental, social and economic impacts of sourcing our top ten raw material ingredients. This helps ensure availability of the categories we need to make our products and aligns with our core values. It also helps us meet our consumers’ growing desire to understand the link between the food they purchase and its origin. As you may imagine, the challenges faced by cocoa farmers in West Africa vary drastically from the issues that are more prevalent with wheat farmers in Kansas or oat growers in Canada. We source raw materials from around the world and as such, tailor our sustainable sourcing strategies to address different risks and opportunities. We’ve utilized three key strategic approaches: Origin-direct investment, continuous improvement and verification. We source cocoa through supplier partners who procure it from smallholder farmers in Côte d’Ivoire, Ghana and Nigeria and similarly, vanilla from Madagascar. We know that when farmers can earn a good living and take care of the local environment, their lives are better and their communities are more stable. That’s why we invest in these farmers and their communities – to improve livelihoods and the sustainability and quality of our ingredients. 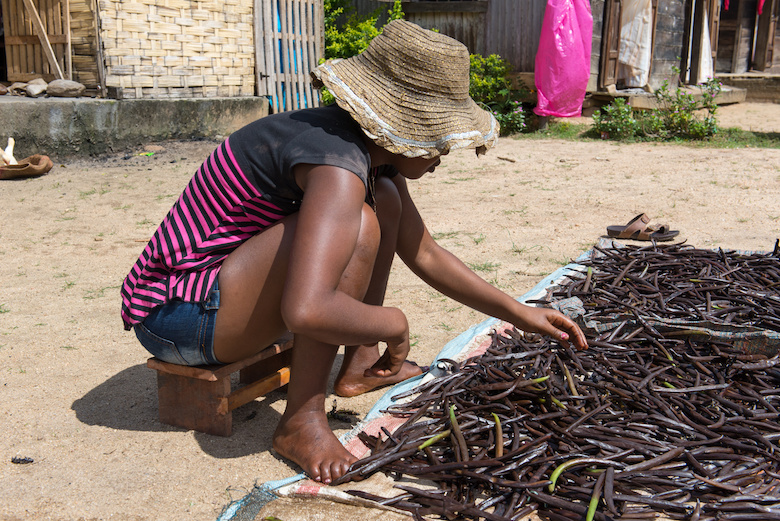 Learn more about how we are improving the sustainability of vanilla grown in Madagascar and of cocoa grown in West Africa. Row crops and dairy are undoubtedly among the most resource intensive of our 10 priority ingredients. To source these raw materials sustainably, we measure the progress of farmers’ raw material and natural resource efficiency, including energy use, greenhouse gas emissions, water quality and water irrigation use, soil conservation, soil carbon and land use. The data gathered from these measures allows us to work with farmers to drive continuous improvement over time in our North American supply chain. Learn more about how we are increasing the sustainability of Canadian oats and U.S. wheat, corn and sugar beets. For milk, we work with farmers and dairy cooperatives to collect data and calculate sustainability impact from the farm to our production facility. Then we meet to review results and discuss how to make improvements in areas like crop production, animal feed and manure management to reduce our greenhouse gas (GHG) emissions and other environmental impacts. We continue to increase the sustainability of fiber packaging, sugarcane and palm oil by working across the industry to improve practices, expand value chain transparency and validate progress. Challenges in these supply chains range from the risk of deforestation associated with fiber packaging to the rights of workers helping to grow and harvest sugarcane and fresh palm fruit bunches. Currently, more than 99 percent of the fiber packaging, 58 percent of the sugarcane and 100 percent of the palm oil we purchase is sustainably sourced. We continue to collaborate with farmers, suppliers and other partners to refine our approach as we seek to more sustainably source the raw materials we use in food production and packaging. For example, to drive progress toward our 2025 goal to reduce GHG emissions, we are increasingly looking at our full global raw materials purchasing through a climate lens. For example, we’re leveraging our existing North American continuous improvement engagements for row crops as a springboard to help famers understand and accelerate adoption of regenerative agriculture practices that store and increase soil organic carbon as well as a host of other sustainability benefits. We know that using limited resources and natural systems in a smarter and more efficient manner is essential to feeding a growing population and lightening our impact on the planet. Learn more about our sustainable sourcing efforts, the results we have achieved to date and next steps in our journey.